Cambodia has a wonderful culture of dancing that is steeped in mythology. We invite you to step back in time and learn about the history of the Apsara dance – and some basic steps yourself – in a very authentic and special experience in Phonm Penh. In Hindu and Buddhist mythology you will often hear about a female spirit (a nymph-like creature), known as an Apsara that rules the clouds and waters. What makes the Apsara special is that they are always dancing and across Angkorian temples in Cambodia you can observe stone carvings of them. (Don’t mistake them for the non-dancing temple guardians/custodians, who are different and known as devatas.) You will find the apsara are common when you travel through Cambodia and Asia. Did you know? Cambodia’s famous Angkor Wat, which was built around 1116–1150 AD, hosts as many as 1,796 apsaras and devata! Within the suburbs of Phnom Penh lies a little wooden house that is the home of an NGO (non government organization) that has been preserving the art of Cambodia’s Apsara dance since 1998. The Robam Tep Apsara is a classical Khmer dance for women that was first formed in the mid-20th century by the Royal Ballet of Cambodia, under the ruling Queen. The dance outfits are intricate, with silk brocades that are pleated at the front. As the costumes are tight-fitting the dancers must be sewn into them. A five-pointed ornate headdress and copper accessories including a decorative collar, elegant earrings, anklets and wrist jewelry with precious gems complete the costume. During your tour in Cambodia, Enchanting Travels guests are invited to meet with the director of the NGO and watch the children being taught all the characteristics of this classical dance whilst learning about the historical significance of the dance. There is then an opportunity to enjoy a two hour dance class. As the dances required male involvement, both men and women alike are invited to participate. After a little physical exercise, you can enjoy a drink and some traditional Cambodian canapés with your teacher and the young students. 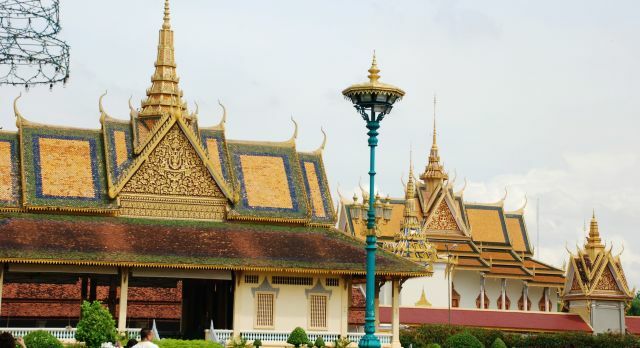 Ask your Travel Consultant to include this unique experience on your next trip to Cambodia! Explore Cambodia no an Enchanting Travels adventure.